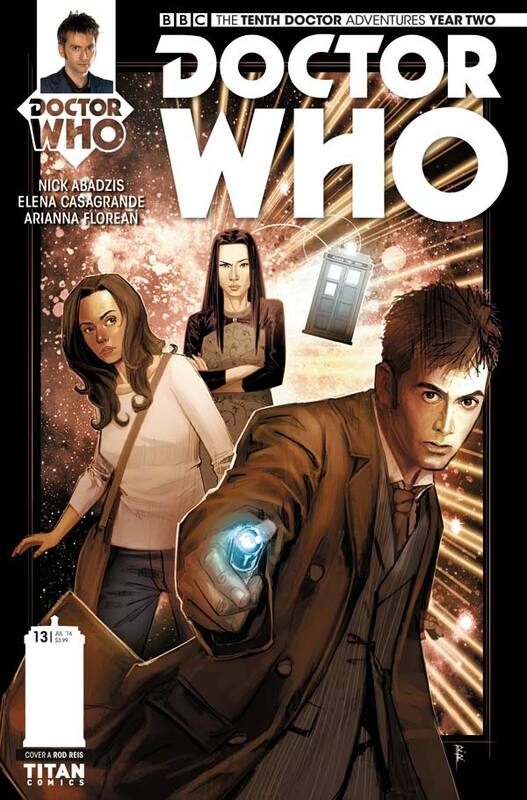 And so here we are: the final arc of Titan Comics’ Tenth Doctor Year Two begins with #2.13. For those keeping tabs on the title, this can mean only one thing. Anubis is back. 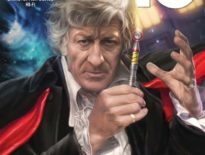 I really hope Fourth Doctor fans are picking up this comic, and having been doing so since the first issue. Anubis is obviously the son of Sutekh the Destroyer, the omnipotent creature from Pyramids of Mars, and this comic’s writer, Nick Abadzis shows a great deal of love for that story and the era as a whole. Importantly, he doesn’t make Anubis into a cheap stand-in for the big guy, and instead explores what else such a being could get up to. Anubis is anchored by Dorothy Bell, his apprentice and a former film star imbued with God-like powers. The pair have an interesting dynamic, Dorothy’s enthusiasm for seeing into parallel dimensions grounded by Anubis, and giving Eleonora Carlini and Giorgia Sposito plenty of great visuals to draw – most notably, the pair’s Garden of Eden-like home. Indeed, Old Girl: Aftermath has quite an unconventional narrative, immediately finding us back in New York with Gabby Gonzalez’s and Cindy Wu’s parents, before a trip in the TARDIS segues us into matters of Gods and demons. The start feels like a much-needed Earth-based interlude, but the interplay is great and its pace is swift enough without feeling like the rug is being pulled from underneath you. It’s nice to catch up with Gabby’s Mum again, partly because she appears to get on so well with the Doctor. Their interactions are perfect, particularly when she’s reading the Time Lord’s palm and concludes, “Your lifeline is… splintered.” He sarcastically asks whether he’ll be rich, and she retorts that he already is: “In the sense that you have many friends, you’re well-loved, you attract only the best and most well-intentioned…” Sentiments like this really suit the Tenth Doctor era – the lone man, putting on a smile but feeling on his own, leaving a trail of friends in his wake. His relationship with Anubis is also a fascinating one: there’s a trepidation there, and a natural intrigue, but his happy-go-lucky façade remains. By the issue’s end, he’s storming off on an errand for Anubis, reluctantly bringing along Cindy (who’s had quite a shock). Cindy’s own storyline is a lovely one, coming to terms with grief and the ramifications of her travels with the Doctor and Gabby. I’m really glad she joined the TARDIS earlier in Year Two of The Tenth Doctor, and can’t wait to find out how her journey progresses. It’s not a completely satisfying comic, however, at least not if you, like me, aren’t too keen on manga-esque art. Actually, that’s not exactly true: manga’s all well and good, it has its own special place, but juxtaposed against the stylised-yet-realistic pages in #2.13, I’m not sure it fits. Sometimes, it works well – Carlini and Sposito keep it generally understated and resigned only to facial expressions – but the issue suffers a bit towards the start. Saying that, the Doctor’s mannerisms are captured wonderfully, and I’m really nit-picking. Compared to similar titles I won’t mention here, there’s nothing to complain about at all. It all builds to a fantastic cliffhanger: inevitable but nicely planned and realised. 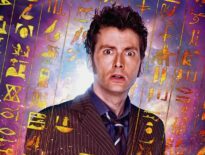 Judging on this issue alone, the final arc of The Tenth Doctor Year Two is going to be something truly special indeed. 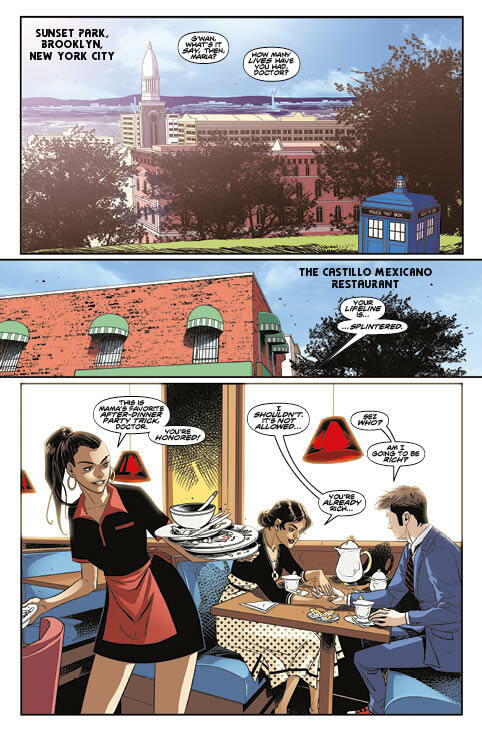 The Tenth Doctor #2.13 is out now, priced $3.99. ← BBC micro:bit Students – The Doctor Needs Your Help Today!